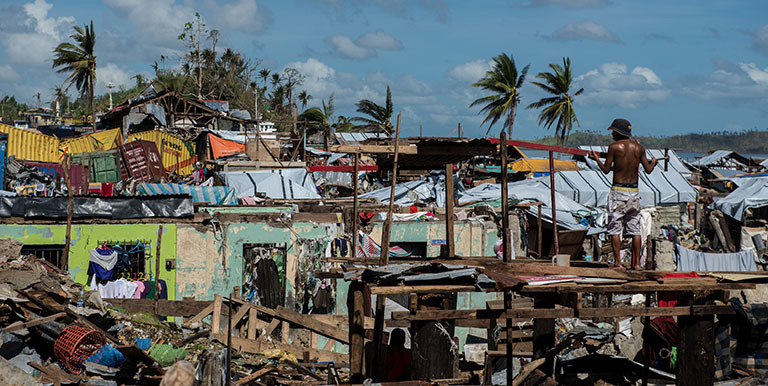 Typhoo Haiyan (Yolanda) in 2013 left billions of pesos worth of damage. Photo credit: ADB. The Philippines is a disaster-prone country as it is located on the Pacific Ring of Fire and within the Western North Pacific basin, one of the basins where tropical cyclones are formed. Catastrophic typhoons like Haiyan (Yolanda) in 2013, Bopha (Pablo) in 2012, and Ketsana (Ondoy) in 2009, and earthquakes like the Bohol and Surigao earthquakes in 2013 and 2017 respectively hit the country in this decade alone. With the expected continuation of rapid urban growth in the cities as well as the impacts of climate change on the frequency and intensity of extreme weather events, future disaster losses could be significantly higher than recently experienced. Rapid availability of financing to support early recovery activities in the weeks and months immediately after a disaster is critical to begin the restoration of essential services and basic functioning of infrastructure. This insight piece was adapted from Philippine City Disaster Insurance Pool: Rationale and Design. Faced with particularly high disaster risks, city governments in the Philippines use a range of instruments to finance disaster risk reduction, preparedness measures, and post-disaster efforts. Instruments for post-disaster efforts include ones that are put in place in anticipation of potential disaster events (ex ante) and ones turned to after an event (ex post). Instruments include the mandated allocation of no less than 5% of the estimated revenue from regular sources to the Local Disaster Risk Reduction and Management Fund (LDRRMF) which is the principal source of all types of disaster-related spending. Part of this resource is allocated to a city’s Mitigation Fund (70%) and part to the Quick Response Fund (QRF) (30%) – an ex ante financing instrument for post-disaster efforts – with unspent balances transferred into the Special Trust Fund (STF) at the end of a budget year. City governments are also required to insure their assets against disasters with the Government Service Insurance System (GSIS), providing another ex ante source of financing for post-disaster efforts. Accessing the National Disaster Risk Reduction Management Fund’s (NDRRMF) mitigation fund once internal resources have been exhausted. However, despite the number of potential sources of funding, cities often face significant challenges in securing adequate and timely funds for post-disaster early recovery operations. The table below highlights the speed, certainty, and level of financing of these instruments. Timely availability of financing to support early recovery efforts is critical. Delays can significantly increase the impact of disasters on local and national economies, as well as on the economic and social welfare of those affected. Likewise, the current post-disaster funding immediately available to some cities could be depleted within a matter of a few weeks under certain realistic disaster scenarios. Disaster insurance can be on an indemnity or parametric basis. The first one provides compensation based on the policyholder’s actual losses assessed by a loss adjuster. Greater damage means higher payout. This is the form that GSIS offers for government assets including city-owned properties. This type of insurance is best suited to longer-term reconstruction as the loss adjustment process can take many weeks and in some cases years. In contrast, the compensation in parametric insurance is based on the physical features of the natural hazard experienced, rather than the actual loss. Levels of intensity at particular locations of features like wind speed for typhoons and ground shaking for earthquakes are pre-agreed and their verification of occurrence provided by reputable independent scientific agencies, which make such data publicly available very shortly after a disaster occurs. Payouts can be expected within a few weeks of qualifying disaster events since there is no loss assessment and can be flexibly used to address a range of potential funding needs. Allow for cross-learning of experience among participating cities. The efficiency, stability, and overall success of parametric disaster insurance pools has been demonstrated at a sovereign level through facilities in the Caribbean, the Pacific, and Africa. PCDIP essentially operates as an insurance company. Cities will purchase insurance cover based on the type(s) of hazard they want to insure against, the frequency and scale of payouts they would like to receive, and the funding available for premium payments. The premiums paid by each city will be based on the level of risk which that city individually brings to the pool. The pool will offer parametric insurance covers for typhoons and earthquakes in its first phase. It is expected to provide cover for floods at a future stage. The level of payout will be determined by comparing the calculated index value for an event against the pre-defined index threshold, or attachment point, for payout and exhaustion point, at which level the entire policy limit is paid, as specified in the insurance policy for each city. If the index value for an event is above the attachment point specified for the city and relevant natural hazard, the city will receive a minimum payout. If the index value for an event reaches the applicable exhaustion point, the city will receive its maximum payout. For an index value between the applicable attachment and exhaustion point, the payout will increase linearly between the minimum and maximum payout: the higher the index value, the higher the payout the city receives. Payouts will be available to the cities within 15 business days of an event. PCDIP is expected to be primarily capitalized through a sovereign loan from ADB in its initial years. It will access the national/international reinsurance and capital markets to provide reinsurance coverage for the pool as a whole. PCDIP offers a financially sustainable solution to narrow the funding gap between available resources for post-disaster response and spending requirements of the cities. It facilitates sound budget utilization in a risk transfer instrument with predictable payout expectations and supports quicker local economic recovery. PCDIP will bolster the fiscal resilience of participating cities and allow them to become more self-sustaining in managing disaster risks and repairing critical infrastructure and assets. With PCDIP, cities will enjoy the numerous benefits of a pool structure, including diversification, economies of scale, and knowledge sharing. Asian Development Bank. 2018. Philippine City Disaster Insurance Pool: Rationale and Design. Manila. ADB. 2015. Technical Assistance for Enhanced Use of Disaster Risk Information for Decision Making in Southeast Asia. Manila. ADB. PCDIP - Philippine City Disaster Insurance Pool: Brief. ADB. City Disaster Insurance Pool Project: Concept Paper. Development Asia. Explainer: What Countries Are Doing to Protect against Climate-Related Loss and Damage. Charlotte Benson works on the formulation of disaster risk management policy at ADB and its application in developing member countries. She has over 25 years’ experience working on economic aspects of disaster risk management, including the fiscal management of disaster risk. She holds a BSc and MSc in Economics from the London School of Economics and a PhD in Development Studies from the University of London. Benita Ainabe specializes in financial sector development, capital markets, innovative financing mechanisms, and regulatory governance and reforms in ADB’s developing member countries in Southeast Asia. She has 14 years’ financial sector experience from commercial financial institutions and multilateral development banks in project (infrastructure and energy) and structured finance for corporate and sovereign debt and equity, securitization and investment management, serving clients in the UK, US, Asia, Middle East, Africa, and CIS countries. She has an MSc in Molecular Medicine from Imperial College London and a BSc in Molecular Genetics in Biotechnology from the University of Sussex, UK. Is Mobile Remittance a Solution for South Asia?